Our aim is to help YOU find the perfect bite alarm to suit your budget and your carp fishing tackle needs. We have put together 3 tables and done hours of research and listed all the features that are important to you. So which is the best bite alarm is the best on the market? Read our buying guide below and hopefully we can help you out. The answer depends on exactly what you are after. There is no “one fishing bite alarm suits all” option as some of you will require alarms with great battery life that will last all week, and some of you will be after a cheap budget option to find out if carp fishing is for you. Do you need one for night fishing? Or are you using them in the day? Are you using them for general coarse fishing? This will effect your buying decision. Battery Type 2 x AAA (indicators). You are probably wondering which one would be our top pick from the ones above. If we had to pick just one, it would be…. The Sonik SKS Bite alarm set this is because it comes with a Bivvy light which we really like and is priced in the middle of the range for premium fishing bite alarm sets. We also like the fact the alarms need AAA batteries which makes replacing batteries a lot easier. All of the above are excellent bite alarms and you can read more about the reviews of each by clicking the “more information” link in the table for each fishing bite alarm set. Let’s have a look at all of the above carp fishing bite alarms in a bit more detail. This set of three alarms, a receiver and an LED light is as advanced as it gets. Each alarm has its own colour – red, blue and white – and along with the audible alarm, the LED lights up on the colour of the alarm that is sounding. The bite alarms are waterproof – there are comments from customers who have used it in heavy rain without problem – and you can select from six volume levels or a silent, light only mode. There is also a vibration alert, it comes with a free bivvy light – a nice touch that many customers have commented on – although you do need to buy batteries (2 x AA for the alarms, 1 x 9v for the receiver) and there is no carry case included. Overall, a nice piece of kit that comes with plenty of recommendations from users, but at a premium price. This set does not come with snag ears though. Similar in style – and in price – to that above, this site bite alarm set and a receiver is worth checking out. Where it differs is that there is no colour differentiation – just a white light that will indicate a bite. Guaranteed as waterproof, what they do offer is a ‘travelling’ LED signal; this runs one way to indicate a drop back, and the other for a run. This feature is very welcome indeed, and will make a good selling point over some rivals here. The alarm is adjustable for volume, and also for sensitivity, plus they are fitted with rubber grips to stop the rod slipping on the rod pod. You need to buy batteries – 3 x AAA for each alarm and 1 x 9v for the receiver – but there is a carry case included. Users speak very favourably about this alarm set, so it should be one for your shortlist. 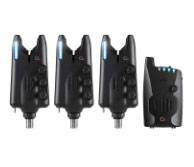 The remote control ability of these fishing bite alarms is one of the major selling points, as you can remain in the bivvy while you adjust the volume and sensitivity of your alarms. This set, from New Direction Tackle, features another great idea in the shape of a mobile phone app, from which you can also control your alarms. Waterproof and well-made, this is not a cheap alarm set, but it is a quality set. You can change the colour of your LED on each alarm and set the receiver to correspond, and you also have a range of in excess of 100m, which is more than enough. Customer comments are very favourable, with particular emphasis on the ease of use and the range. The batteries for this set are not the standard type: you need to buy ER14250M or C2 batteries, and we recommend you purchase them at the same time as the set. Overall, a very good fishing bite alarm set, but at a high price although you do get a nice carry case. This set of alarms is undoubtedly of the very highest quality, and also comes at a supremely high price. Nevertheless, we include it because it offers everything you could want in a bite alarm set. You get three alarms and the receiver – as seems to be standard – and also a set of snag ears, making this a nice package. Waterproof, with adjustable LED indicators, volume control and also an anti-theft alarm, everything can be set remotely from a good distance away. The high-visibility LED indicators – two on each alarm – can be set in a choice of six colours, and there is also a night light function. Batteries are not included so you have to equip yourself with those, and the makers say that battery life can be in excess of a year. This is a great set of alarms, but we advise you to look very carefully at the others on this list, as the price is somewhat inexplicable. If you wish, you can also buy the alarm unit separately. You are probably wondering which one would be our top pick from the ones above for carp fishing. If we had to pick just one, it would be…. The Nash Siren. Having personally used these they have never let me down. Its the 2nd most expensive on the list but its just a solid well made reliable alarm. However, if you have a bigger budget for a single alarm then you should probably get the Delkim. 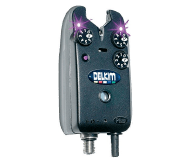 This is another take on the Delkim TX-1, as with this package you purchase the alarm only, and no receiver. As with the package deal, it’s a fully waterproof bite alarm that you can buy with a choice of different LED colours: green, blue, white, red or purple. It’s not cheap, especially when you’re only getting the bite alarm, but it is very good. Not only can you vary the volume, tone and sensitivity, but with this model you can also adjust the brightness of the LED, which is handy for those dark nights. The controls are made to be easy to use in poor light and the anti-theft alarm is a welcome touch, too. The built-in FM transmitter means it is compatible with the Delkim RX Plus Pro Receiver, which we remind you is not part of this package, and you need to supply your own batteries for this one. As we said, it’s not cheap – in fact it’s among the most expensive here – but it is very good and does everything you want from a quality bite alarm. 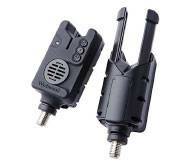 This single bite alarm and receiver set will appeal to anyone who wants to add an alarm to their existing kit. It’s a decent price, and is also available as a set of three with a carry case. There is no case with the single option, yet it does offer sensible features and is a quality item. The LED indicator lights can be in either red, white or blue but cannot be changed, and the alarm section comes with adjustable snag ears for added versatility. Sound and sensitivity are both remotely adjustable, as is the tone of the alarm. You need to buy the batteries for this one – it takes a 12volt 23A type – and it does not have a night light feature. It’s fully waterproof as you would expect, and customers have talked about its excellent range, which is around 150m. 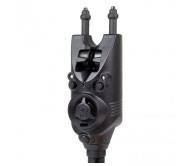 If you want a single alar and receiver it’s a good choice. Bear in mind that this is just the Nash Sire alarm we are reviewing here, and it’s a nice – if somewhat expensive – model from Nash. The Nash Siren R3 comes with all the features you would need for a very decent alarm, but the fact it comes without a receiver (you can buy one separately) makes it a curious choice. Having said that, as customers have said in the comments, it can be used on its own perfectly well, although there is no ability to remotely set the alarm up. You can have it with blue, green, white or red LED signal lights, it is fully waterproof, and it comes with a neat protective casing. 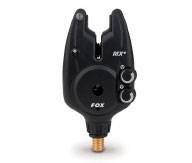 The alarm features snag ears, has a mute button, the volume is adjustable and so is the tone, and it is easy to use. As seems to always be the case, you need to buy the batteries for this one. If you want a single receiver and are prepared to pay the price, then the Nash Siren will do the job perfectly. Another example that is just the alarm, this model from Fox is around half the price of that listed above, so that’s worth bearing in mind if this is what you want. It’s a typical quality bite alarm in every way, waterproof and well-made, and works via 2 x AAA batteries which are not supplied. This one has a bright blue LED light that indicates when you have a bite, and is adjustable for tone and volume. You also get adjustable sensitivity across two settings, so you can eliminate false alarms. The controls are all large and easy to use, it’s a simple to set up bite alarm and, although listed among our premium buys, is a reasonable price. Compatible with the same makers TX-R transmitter, this single item does come with a nice hard case for added protection. You are probably wondering which one would be our top pick from the budget alarms if you are new to carp fishing. If we had to pick just one, it would be….The Hirish 3 piece set with receiver. For roughly £30 its a great piece of kit and you get everything you need without spending too much. These are only available on Amazon though so you won’t be able to get them in your local shop. What I will say though is that the NGT alarms were my first ever bite alarms that I used for my first year of carp fishing. They are a great entry model so if you are just starting out, it might be worth just buying one of these. 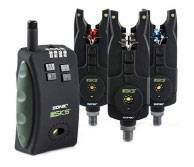 The first of our budget choices is this three-piece set of alarms – there is no receiver with these – that are perfectly decent at a genuinely bargain-level price. You get three alarms, each with two LED indicators; the green indicator will tell you when the line pulls back, the red when it drops. The volume, tone and sensitivity are all adjustable using easy to handle and suitably large controls. The alarms are waterproof, and have an automatic night light sensor. They are supplied in a nice, zipped case for carriage and added protection. At the price, if you want alarms only and don’t need a receiver or remote control, there is nothing wrong with this set at all, so it’s worth looking at if you’re on a budget, and remember to buy 1 x 9-volt battery for each. The first thing to say about this single alarm from Touchstone is that it is very cheap. Think the price of a couple of beers, and you’re in the ball park. It’s just an alarm – one only, and no receiver or remote – but if that’s all you need, we see no reason why you shouldn’t check this one out. It comes with dual LED’s – in green and red, with the green being a battery indicator only – and is very simple to set up and use. The controls are large enough to be handled in poor visibility, and comes with full adjustability for sensitivity, volume and tone. Customer comments are largely favourable, although some have mentioned that this is a very small device in comparison with some others. The battery is the A23 type, but almost uniquely among these reviews the Touchstone alarm comes with one already fitted. You also get a fabric carry bag, so all-round it is a very good value alarm, if simple and very basic. Hirisi has a range of surprisingly affordable carp fishing tackle gear, and this set of alarms is very good value indeed. You get four bite alarms and a receiver, so you can settle back in the bivvy and wait for the bites. 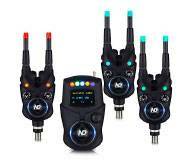 These have coloured LED’s so your receiver can show you which is sending the signal – as with many more expensive models. A red light on the alarm means you have a run, a dropback will give you both red and green. 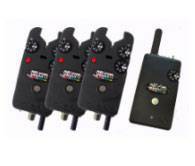 The alarm units automatically pair with the receiver, so you are ready to go once you get them out of the protective black hard case that they are supplied with. Tone, volume and sensitivity can all be adjusted by pushbuttons on the alarm itself, and a range of more than 150m is promised. They are waterproof, and customer comments are very favourable, with particular emphasis on value for money. If you want a budget set of alarms that offers all the features, this could be it. 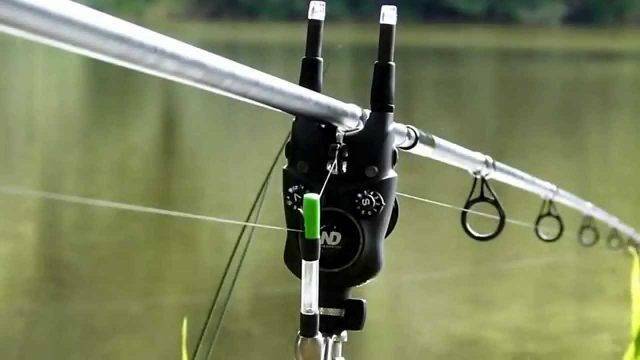 NGT is well known for its affordable carp fishing and coarse fishing tackle, and this bite alarm – the VX2 – is highly typical of the brand. Simple and basic – which is what you would expect for this very cheap price – it does what it says, with no frills and no need for them. It’s waterproof – it is worth bearing in mind that, as with all of those on the list, that means it will withstand the rain, not being immersed in water – and has adjustable tone and volume, but not sensitivity. It has the usual twin LED’s for indicating your bite, and is simple to set up and use with large controls. As with all of these, it uses a standard screw attachment, and it comes with a battery included – a long-life LRV08 type for future reference. You also get a nice zip carry bag with this one, and given the price, we think it is very good value if all you need is a cheap, straightforward bite alarm.